James Montford is on a quest to define “Black Indian,” which, for this seasoned artist, is an ongoing personal and aesthetic exploration. He envisions his work as a conversation—about identity, social justice, oppression, racial stereotypes, and the persuasiveness of myth, such as the myth that we are living in a post-racial world. Employing appropriated racially charged imagery—such as blackface minstrel show figures, so-called pickaninnies and, more recently, the “hands up” posture adopted by activists across the country in response to the arrest and death of Eric Garner in New York City. This poignant gesture also recalls Goya’s great painting the Third of May. Montford doesn’t shy away from addressing stereotypes and institutional racism head on. 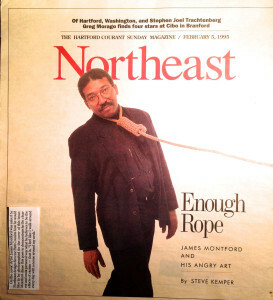 For more than 40 years, the mixed race artist has been both visual storyteller and agitator, drawing on his own experiences of racial confrontation and current events to create two-dimensional artworks, installations, and performance art that are both vile and humorous, elegant and grotesque—a sobering reflection of our racial history but, more frighteningly, of the tumultuous racial landscape we still occupy.